Please accept this letter of recommendation regarding our experience with Ms. Debbie Gerber-Mahan. She has represented us on 5 occasions in the past twelve years and we could not be more pleased with her services. She is definitely a top choice for anyone needing a realtor to buy or sell property….She is confident in her knowledge of the industry and her level of expertise is always very reassuring. In other words she is very trustworthy. When you work with Debbie, you are being guided by an expert in the field. Debbie gave us hope again when we needed it most, and sold our old home within about a month of listing with her! After being listed with another Realtor for 6 months and going through several price drops and numerous showings without receiving any offers, we had given up hope of selling our house in the declining Tallahassee real estate market….We let the listing expire but got a letter from Debbie saying simply that she believed that our house was still “sellable” despite the tough market….Within a month of listing with her we had a solid offer and sold the house soon afterward. 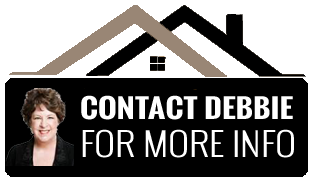 I recently called Debbie Gerber-Mahan to help me find a home. This was the second time that I would be using her. There were several challenges along the way but Debbie stayed in touch and always kept a positive outlook. This was not due to the possibility of a huge commission, rather, she worked like this because this is who Debbie is: a professional person who makes you feel that your prospective home is important, regardless of the price, location or features. I would refer anyone I know to her. We want to thank you for your courteous and professional service during the entire period of selling our house. Selling in a buyers’ market is never easy but you guided us along the path from the original listing to consultations about different buyers’ questions to the final sale….You helped us with pricing and dealing with a buyer who was not easy to deal with. Your patience and professional manner made getting through some difficult days easier….Thanks also for working with us to buy our new house. We are very pleased and we certainly will continue to recommend you to anyone seeking to buy or sell a house. We would like to take a minute and commend our Realtor, Debbie Gerber-Mahan, on the exceptional service we received during the recent sale of our house. We first met Debbie 18 years ago when we came to Tallahassee and purchased our home through her. She stayed in friendly contact with us over the years and so when it came time to sell our house, the first person we talked with was Debbie….We would highly recommend Debbie to any prospective customer, whether a buyer or a seller. She is very diligent in her responsibilities and is an excellent communicator. We received feedback from her on every potential buyer that looked at the house. She takes a personal interest in her clients and will make every effort to meet or exceed their expectations. This is a letter of recommendation for Debbie Gerber-Mahan who sold our house in the midst of a terrible downturn in the housing market. (We had bought it from her 3 years prior). Debbie also worked very hard, and was successful, in locating a new home for me. From the very beginning, Debbie was the bright spot in having the house on the market. I really could not have gotten through it all (the selling and the buying) without Debbie’s grace and determination. She was the coach and the cheerleader! I am grateful for having had her as a realtor and you can be assured that should I find myself in the market for a new or second home or decide to sell my home, it will be Debbie whom I call. Debbie Gerber-Mahan gets our highest recommendation. She managed the sale of our house in Tallahassee during a particularly difficult time in the real estate market. She is an expert! Her strategies and skills helped us get the very best price for our home. Her connections with other agents, mortgage bankers and closing agents are extensive and helped expedite the sale. Thanks to her efforts, we were well informed through-out the selling process. We recommend her to ALL prospective clients. We would like to thank you for making the purchase of our new home so pleasant. We found, early on, that Debbie Gerber-Mahan was a top notch Realtor. First of all, she was very genial and easy to talk to. Secondly she was very knowledgeable and able to answer all our questions without hesitation. But the most important asset that she has is in following up with the customer and keeping them informed. Again, we highly recommend her and will definitely use her again when the time comes. I would like to thank you for performing your best on the sale of my home. You are truly one of the best in the business and may I say always professional in what you did to sell my house. You have sold all my homes in the past but I felt this sale would be one of the toughest with the market being a buyers’ market. You not only sold my house in a depressing market but you got a great price for my house. I followed your professional direction and suggestions and you stayed in touch with me at all times and with all who showed my house. You truly marketed my home and I can’t thank you enough for such a professional job well done and will always recommend you to my friends or to anyone who asks. Debbie, thank you so much for helping us sell our home and buy another one. I met you some 9 years ago when you sold my first house for me. You gave me pointers on how to get the house sold fast and you were right. After that experience I knew that I would always use you as my Realtor and recommend you. And thanks for helping us find the perfect home as well as for your hard work in selling our current house in such a short time. Your experience, honestly and sense of humor made, what is usually a very stressful process, an easier one. This letter is to commend our realtor, Debbie Gerber-Mahan, for her quality service. She was very helpful in our search for a home; quickly grasping our interest in home style, location and price. She worked efficiently to help us find the perfect house. She was patient and professional from start to finish, making herself available to our schedule through the closing. We highly recommend Debbie for any future home buyers. Please accept our thanks and gratitude for the efficient, caring and professional manner in which you conducted yourself during the entire process of showing and selling the property we purchased from you. Your advice was accurate and sound and you were very knowledgeable about the local lenders. Debbie was honest and forthcoming; someone who truly cares about meeting the needs of her clients. She does not use high pressure sales techniques and relieves stress by keeping in touch and updating her clients throughout the entire process. We were blessed to find her. Debbie, once again, you have made selling our home a pleasant experience. We could not have been any happier. At the outset, you provided us with professional guidance in positioning our home for a maximum sale which resulted in a full value contract. But your help did not stop there. With all the frustration before and during closing, it was your guidance that brought us to a satisfactory closing. Again, thanks for all your help. Buzz and Betty Ann K.
We just want to thank you for your help in finding us a great home. You were always available and you really listened to our thoughts, desires, likes and concerns as we went through the process of coming back to Tallahassee. We have purchased 7 homes over the years and your professionalism and courtesy helped to make this the best experience of its kind.